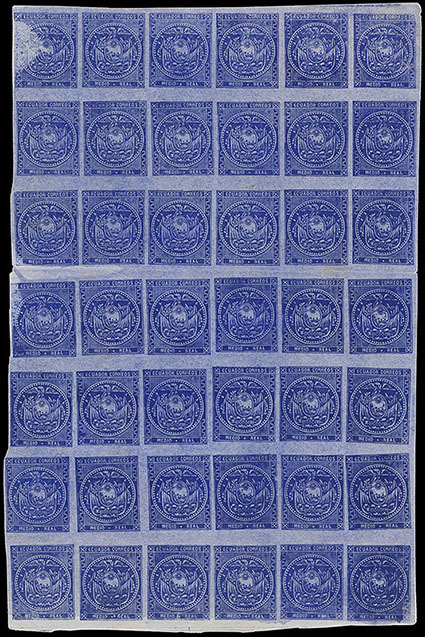 Ecuador, 1865, ½r Blue, pane of 42 from the right half of sheet (positions 7-12/ 19-24/ 31-36/ 43-48/ 55-60/ 67-72/ 79-84), showing characteristic misalignment of transfers of this plate, bold aniline blue color (locally produced ink) which caused paper surface coloration during the printing process, horizontal crease in margin between 3rd and 4th rows, Very Fine, a very scarce large mint multiple, ex-Funkhouser and Longhi. Scott No. 2 Estimate $1,000 - 1,500. 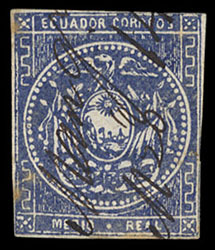 Ecuador, 1865, ½r Blue, manuscript "Tulcán" cancel, large margins, Very Fine, the only single stamp known with this cancel in manuscript. 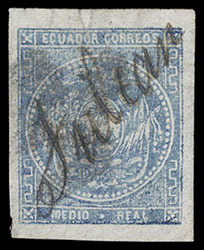 Ecuador, 1865, ½r Blue, manuscript Manglar Alto cancel, margins clear to just touching, Fine, fewer than five items are known from this tiny town. 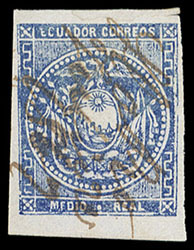 Ecuador, 1865, ½r Blue, manuscript "M alto, Julio 20, 1867" cancel of Manglaralto of Guayas Province, ample to large margins, trivial tiny separation cut in top margin, Very Fine, less than five stamps known bearing this manuscript cancellation. 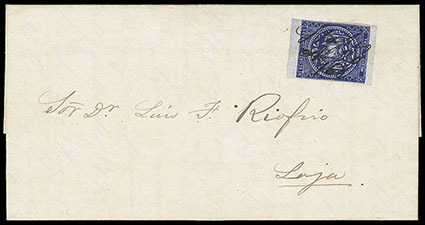 Ecuador, 1865, ½r Blue, clear to huge margins, canceled by "Sta Rosa, Ab 20/ 68" manuscript on fresh 1868 folded letter from Santa Rosa to Loja, Extremely Fine, ex-Longhi and Olgieser. THE ONLY RECORDED FIRST ISSUE USAGE ORIGINATING FROM SANTA ROSA. Santa Rosa is a tiny town about 10 miles south of Machala in the southwest of Ecuador. 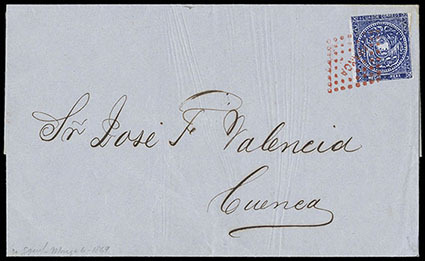 It is believed that no postal handstamp were used at Santa Rosa and no examples were recorded by expert Jorge Ayora at the time of his work on usages of the first issue. 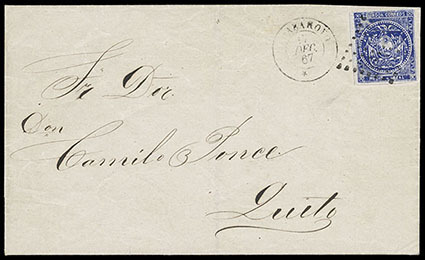 Ecuador, 1865, ½r Blue, Four Singles, clear to large margins, one with marginal rule at left, all tied by "Guayaquil, 4 Nov, 68" cds on folded letter to Lima, Peru paying the single external rate to an American destination up to ¼oz., reverse with "Lima, Nov 868" receiving backstamp, Very Fine, ex-Yardley; with 2011 Moorhouse certificate. Scott No. 2 Estimate $1,500 - 2,000. 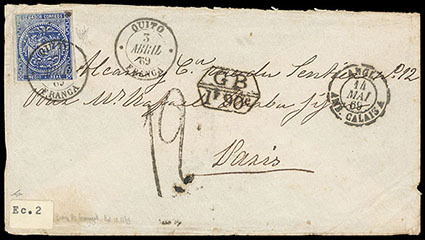 Ecuador, 1865, ½r Blue, clear to large margins, tied by dotted lozenge cancel with matching "Babahoyo, 17 Dec, 67" cds alongside, on fresh folded letter to Quito, Very Fine, the Babahoyo town handstamp is very infrequently found used on private correspondence, ex-Ayora and Olgieser. Scott No. 2 Estimate $750 - 1,000. 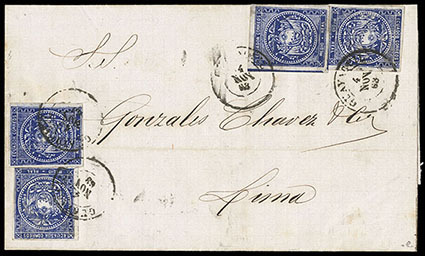 Ecuador, 1865, ½r Blue, on fresh 1869 folded letter tied by red "Franca" dotted lozenge of Guayaquil which was introduced in 1868 and was applied in black and red (the later less often), addressed to Cuenca, Very Fine and choice, a beautiful ½ reale usage. Ecuador, 1865, ½r Blue, showing outer frameline flaws at left and right, tied by "Guano, 15 Jany, 69" cds with month inverted and year date in negative, on Judicial wrapper to Riobamba with "½ oz" weight notation at top, Very Fine. After the year had been removed from the first type town handstamp, this type was used during the second period of printing.